I really don’t know where this summer has gone. My son graduated from boot camp. My daughter graduated from high schoo. My oldest son went on a mission trip to Honduras. I decorated for vacation bible school and I’ve traveled a lot. The past few months have passed by in a flurry. Things are slowing down a bit but, I still find it hard to fit in my day to day activities and have time to wash our growing pile of laundry and prepare healthy meals for my family with high quality ingredients. 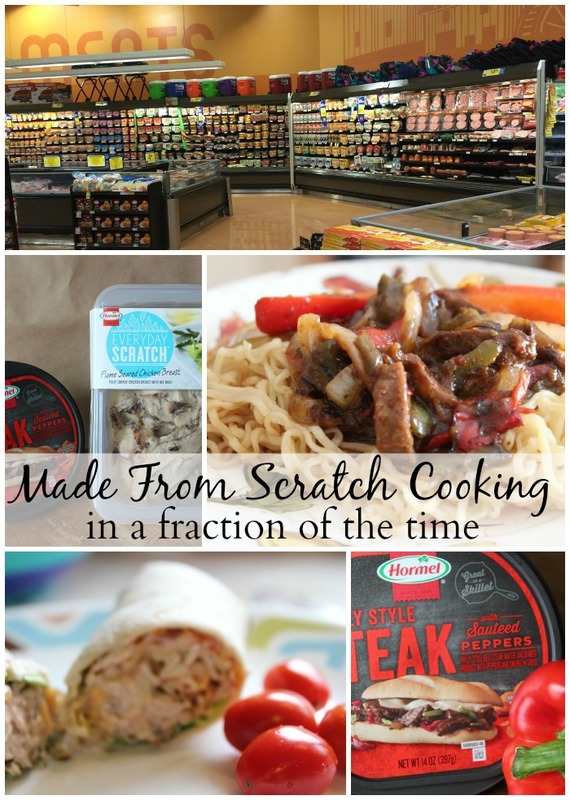 I was thrilled to find new Hormel products in my local Kroger Marketplace that allow me to whip up meals for my family that offer that made from scratch cooking experience in a fraction of the time. And I love that next time my family travels, I can whip these meals up quickly and easily in our hotel room, providing ready-to-go proteins not only at home, but on the road as well. I found the Hormel Everyday Scratch, with straight from the grill flavor, in the refrigerated meats and entree section at Kroger and picked up a package of the Flame Seared Chicken Breast. 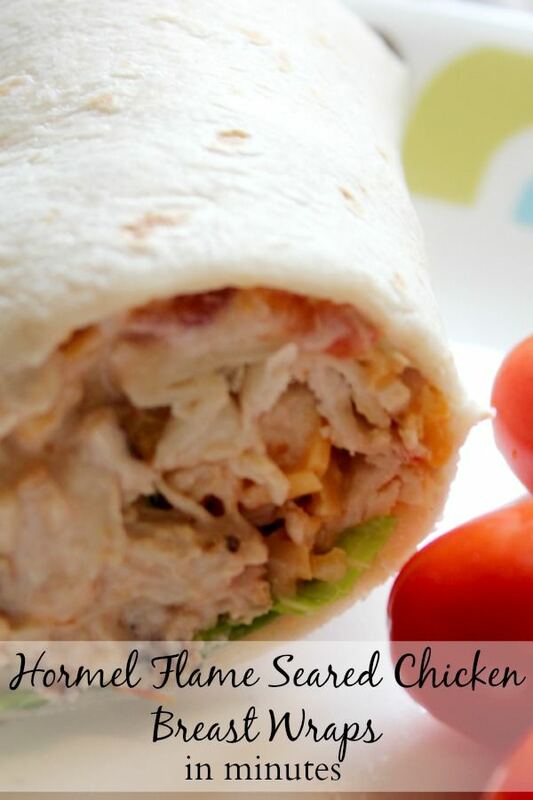 I have a yummy chicken wrap recipe that my husband loves, but I don’t make it often because it takes a bit of time. 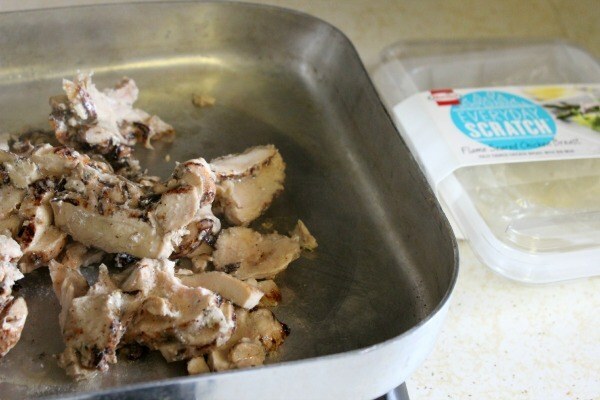 Normally I boil or grill a few chicken breasts, which I then cut up to use in the recipe. Hormel Everyday Scratch saved me that step while providing that straight from the grill flavor I was looking for. I picked up a few extra ingredients, mild cheddar cheese, grape tomatoes, mild salsa, sour cream, romain lettuce and buritto size tortilla wraps. My parents’ enjoy going to garage sales and bought me an electric skillet for a quarter, which I added to my portable kitchen with my Squish products. It really comes in handy. I could have opted to heat the Flame Seared Chicken Breast in the microwave, but instead, I whipped out my skillet. 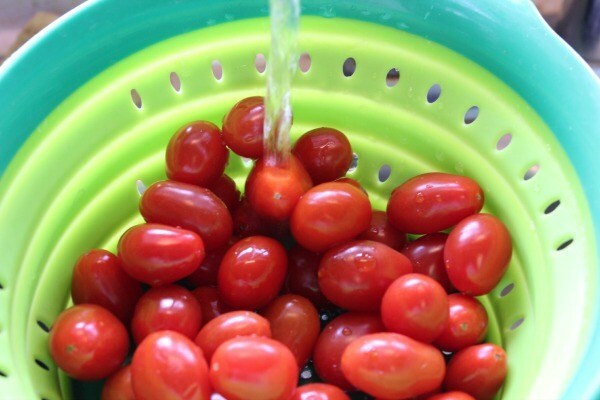 Next, I rinsed the lettuce and package of grape tomatoes. Once the tomatoes were rinsed, I sliced them in half and chopped the lettuce. 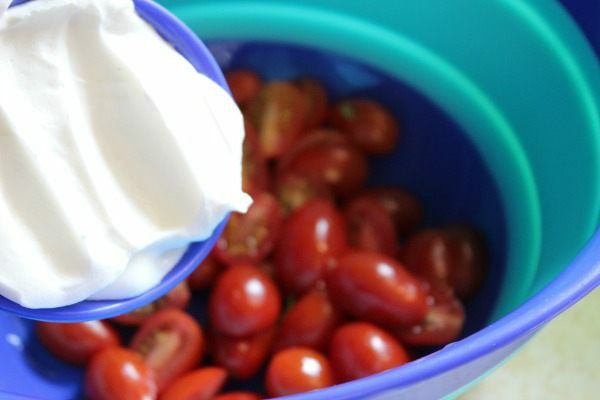 I added a cup of sour cream to the tomatoes. 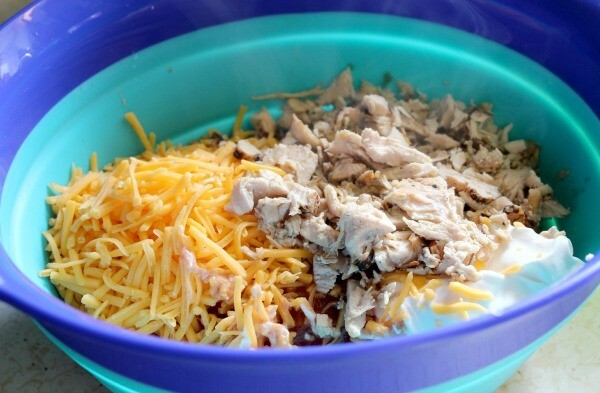 I used regular sour cream, but I’ve also used reduced fat and fat free options in the past. I also added a half cup of mild salsa and one cup of mild Cheddar Cheese. Finally, I added the chicken, stirred and set aside. Next, I heated the tortillas in the microwave (you can also heat them in the oven for a few minutes) to soften them so they are easier to roll. I added a bit of lettuce to the tortilla with a couple generous tablespoons of the chicken mixture and was ready to serve my family a delicious wrap in less than 15 minutes. I didn’t stop there though. My family has a lot of travel coming up and I wanted to try a new recipe that I plan to make in the hotel room. 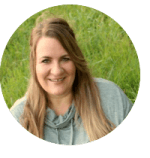 When we started traveling with my husband’s job, over ten years ago, there were times we didn’t have a lot of money. Some weeks were really tight. To cut back, I’d buy packs of Ramon noodles. We ate them plain, in soups and with corn or green beans mixed in. We tried many variations of Ramon noodles. Too many, if you want to know the truth. So many that my kids are concerned when they see me buy Ramon noodles at the store today, and they often ask if we’re broke. That’s not the case now, but Ramon noodles travel well. They require no refrigeration and very little space so it’s kind of a no brainer to pick up a few packs before we hit the road. Still, it’s nice to have more of a meal than a snack so I was looking for something easy but delicious. A new twist on Ramon noodles, if you can imagine that. 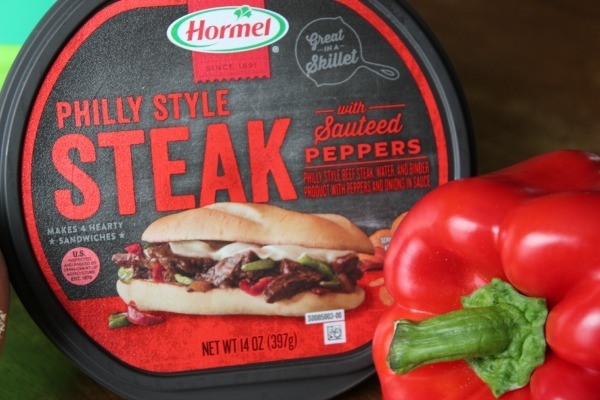 When I spotted the Hormel Philly Style Steak Hot Sandwich Meat I got an idea. Who says you need to eat it on a sandwich? Why couldn’t I serve it over Ramon noodles? So, I picked up a couple packs of beef flavored noodles, an onion and a red pepper and headed for the checkout. 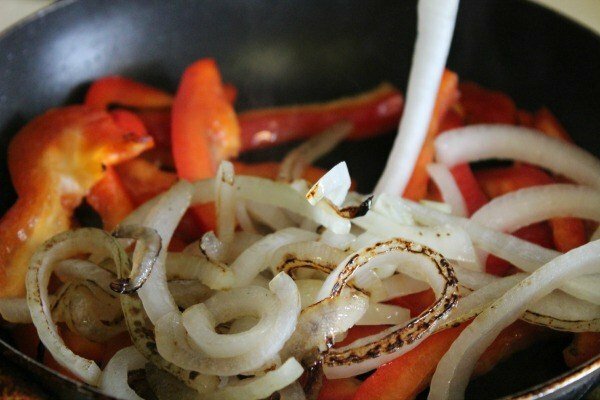 I sliced the onion and red pepper (peppers are in the Philly Style Steak mixture, but I have a thing for peppers so I added more) and sauted it over medium heat. I also heated the steak mixture on the stove, though it would have been just as easy to throw it in the microwave for a few minutes. 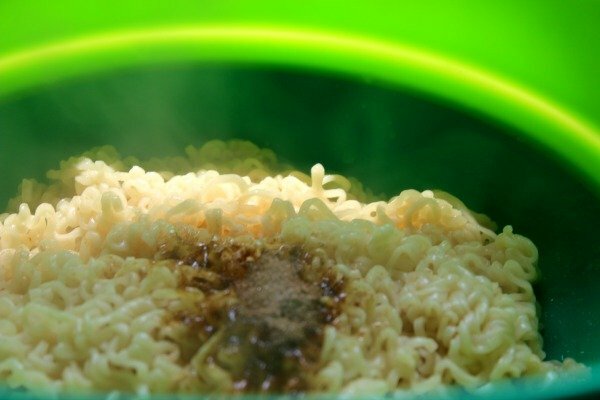 While that was heating up, I boiled water for two packages of Ramon noodles. They cooked to my desired consistency in three minutes. 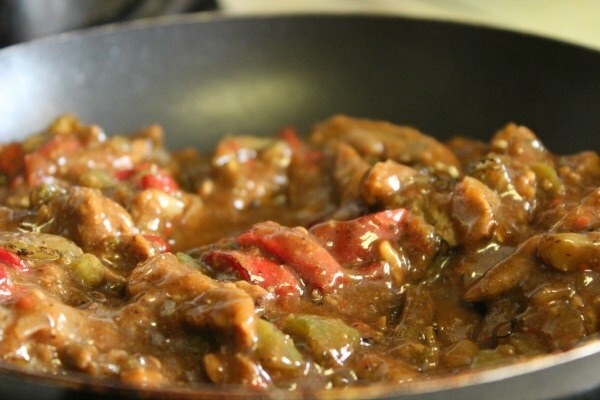 I drained them and I added 1/4 of a packet of beef flavor that was included. 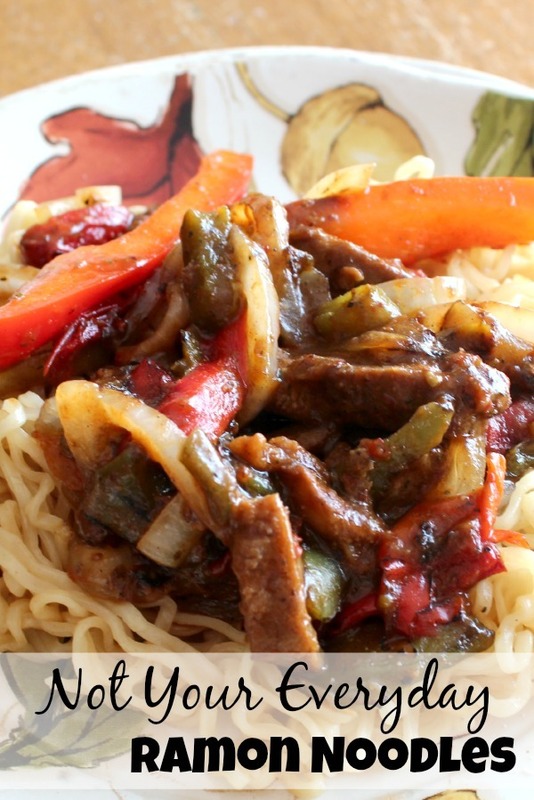 I added the steak mixture to the noodles and served them to my family. 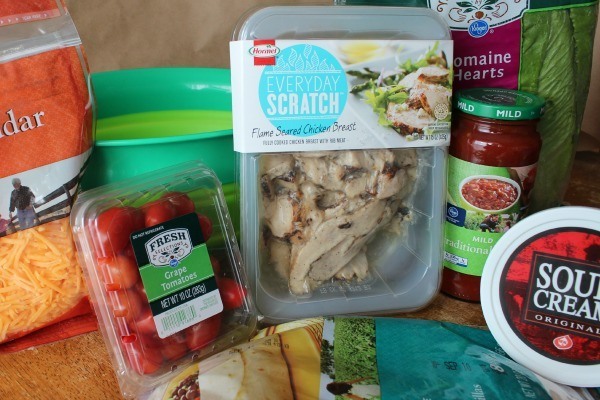 From start to finish, this meal took less than 15 minutes to create thanks to Hormel Everyday Scratch and Hot Sandwich Meat, products that provide a a head start to your favorite meals. My experiment paid off. My family agreed that the Philly Steak Ramon Noodle dish was definitely a keeper and worth duplicating in the future. Would you like to try one or both of these recipes and interesting new and different products from Hormel? These products offer great taste, freshness (no preservatives + 0g Trans Fat), simple, versatile protein, found at Kroger in the refrigerated entrees section. 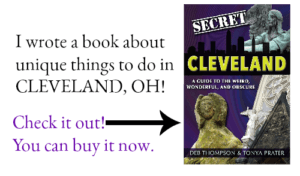 Plus, I have a coupon to pass on so you can save a dollar or two on your first purchase. Save $1 off (one) Everyday Scratch product or $1 off (one) Hot Sandwich meat product. Coupons expire one month after they are clipped. The coupons are also location specific so they may not be available in all areas. What would you make with the Hormel Everyday Scratch or Hot Sandwich meat product?